When Sean McKirdy was substituted after just over an hour of Hearts Under-20s’ victory over Dunfermline last Thursday, he’d be forgiven for feeling deflated. However, the 17-year-old’s spirits were quickly lifted as coach Jack Ross told him he was going to be involved in the first-team’s clash with Raith Rovers at the weekend and that he’d ‘better get ready for it’. The tenacious teen was rewarded with his league debut in the 2-1 victory, replacing Kenny Anderson 12 minutes into the second half and slotting in alongside Morgaro Gomis – a player 12 years his senior – in the Jambos’ midfield. McKirdy looked every bit the seasoned pro as he posed for photographs with fans who had gathered outside the main entrance at Tynecastle after the match to compliment the youngster on his performance following the opportunity afforded to him by head coach Robbie Neilson. McKirdy had made the matchday squad a handful of times already this season as well as being given a brief run-out in the 4-1 Petrofac Training Cup defeat to eventual winners Livingston in August last year. 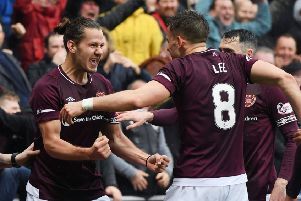 But when his big moment came on Saturday, the youngster shrugged off his pre-match nerves to produce a display which had many Hearts fans believing they were watching a star of the future. “I came off last Thursday in our under-20s game and Jack Ross told me that I was going to be involved in the match at the weekend so to get myself ready for it,” the teenager explained to the Evening News. “I was a wee bit nervous on Friday night and then again on the morning of the match when I was left to think about it and what might happen. “But when I went on I actually felt quite relaxed as it was just another game of football so it never felt that different to what I am usually used to. “The supporters were great with me as well and that made me feel so much more at ease. “I thought I did okay in the time I was on, I just tried to keep things simple and get involved as much as I could. The boys made it easier for me and helped me through it so I really enjoyed my time out there. Reflecting on his only other appearance in a maroon first-team jersey against the Lions eight months ago, McKirdy, then aged 16, believes he has matured since that summer’s evening in West Lothian. “Looking back at the Livingston game, I was happy to have made my debut but we lost heavily so I had some mixed emotions afterwards,” he explained. “But Saturday was completely different, a great feeling to be on the winning team and have everybody congratulate you afterwards. “But training in and around the first team all the time has really brought me on this season. Playing in the under-20s against first-team players, I definitely feel I’ve come on a lot these past few months. “I’ve just got to keep my head down, work hard and try and impress in training and when I’m involved in matches. McKirdy, a former Hutchison Vale player, was also forthcoming in his appreciation of the role a club renowned for its youth development has had in helping him realise his dream of becoming a professional footballer. While McKirdy disclosed there is a real buzz around the club with Hearts’ Championship-title winning party now just 11 days away, he insists there is still a lot of work to be done before the champagne corks can be popped. He said: “Everyone is getting really excited about the game against Rangers and what will follow afterwards. It will be a great day getting the league trophy with a packed-out Tynecastle, but there is still a bit of work to do before we can enjoy that moment so we need to make sure we don’t drop the standards we’ve set in the remaining two games. Neilson himself has been hugely encouraged by the enthusiasm and commitment shown from his young player this season and says he more than warranted some game-time against Raith with the possibility of more minutes to come against Cowdenbeath this weekend. “Sean did really well so I was really pleased for him,” he said. “He’s been here for years and is a player that all the senior players have really taken to. “He’s respectful, looks after himself and listens to what people have to say so he’s the type of player we want to bring through at Hearts.